The Kid Trailer Thru Axles allow users to attach a “hitch mount” style trailer, to any thru-axle equipped bike. Machined and tested in the USA, the Kid Trailer axles are designed for maximum strength and ease of use. Designed, built and quality tested in the USA. Trailer hitch is NOT included. For use with hitch mount style trailers common with child carriers such as Thule/Chariot, Burley, InStep, Croozer and more. Customers will use hitch provided by trailer manufacturer. 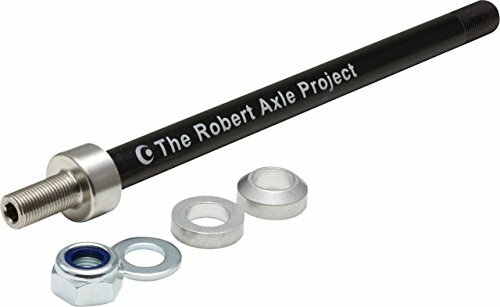 Stainless steel axle end provides an M10x1 threaded stud that accepts any hitch from popular trailers. Installed or removed using a 5mm Allen wrench. Compatible with Syntace 12 x 135 and 12 x 142 axles as well as other manufacturers with similar dimensions. Length: 167mm or 152mm with included tapered spacer. Thread pitch: 1.0mm.